Rep. Dave Sharpe (D-Bristol) speaks Wednesday on the House floor. After weeks of delicate deliberation, the Vermont House on Wednesday approved a long-promised "fix" to controversial school spending thresholds set to take effect next fiscal year. By a vote of 94 to 52, the House opted to give school districts more breathing room in their budgets — and to reduce the penalties they would face if they overspend. Problem is, the Senate chose an entirely different path last week — to repeal the thresholds altogether — and its leaders aren't budging. "We're standing strong," Senate Education Committee Chair Ann Cummings (D-Washington) said Wednesday. Though he characterized himself as "eternally optimistic" that the two bodies could reach accord, House Speaker Shap Smith (D-Morristown) conceded late Wednesday that he had no idea how they would. "If I knew the path forward right now, we would be on it," he said. "But I think it's going to take a fair amount of work — the next couple days and maybe a week." Time is not on their side. The uncertainty has left local school boards wondering how much money they can spend, even as they race to complete their budgets ahead of Town Meeting Day. Gov. Peter Shumlin said Monday that he would need a bill on his desk by early next week for it to make a difference. Though he favors repeal, the governor said he didn't view the disagreement as "my way or the highway." The controversy has its roots in the passage last May of Act 46, which was designed to reform school governance by encouraging smaller districts to merge. At the time, many moderates and conservatives — particularly in the House — insisted that the bill include cost-containment measures, in order to slow the growth of property taxes. A last-minute compromise capped the amount each district could increase its per-pupil spending at a variable rate of 0 to 5.5 percent, depending on the prior year's rate. Excess spending would be penalized. Last fall, it became clear that more districts than expected would exceed the thresholds, prompting legislators to promise a change. "The bottom line is we put something together that we did not think through," Rep. Heidi Scheuermann (R-Stowe) said Monday. "Frankly, we look incompetent." When the legislature returned three weeks ago, the Senate took quick action to repeal the spending thresholds. The vote was 28 to 1 in favor, with Sen. Dustin Degree (R-Franklin) casting the sole dissenting vote. But in the House, the arithmetic was more difficult. Some felt the new limits had succeeded in trimming budgets, while others felt they were unfair, disproportionate and ought to go. After weeks of false starts, the House Education Committee and the House Ways & Means Committee settled on an approach last Friday that would allow each district to increase spending by another 0.9 percent and would reduce the penalties they faced by 75 percent. Districts could choose the more advantageous of two rates mistakenly provided by the Department of Education. "Faced with this dilemma of whether, on the one hand, we should repeal [the thresholds] completely and, on the other hand, we should do nothing, your committee worked very hard to come to a middle ground," House Education Committee Chair Dave Sharpe (D-Bristol) said on the House floor Wednesday. Rep. Sarah Copeland Hanzas (D-Bradford), the House majority leader, warned legislators they didn't have many options. "No matter how many times we count the votes, we don't have the votes for repeal," she said. Indeed, they didn't. An amendment offered to scrap the thresholds altogether failed in the House Wednesday afternoon on a vote of 30 to 117. That could prove problematic should the Senate stand firm. The bill will land back in the upper chamber on Thursday, at which point senators could adopt the House's approach, recommend further changes or call for a conference committee to sort out the differences. 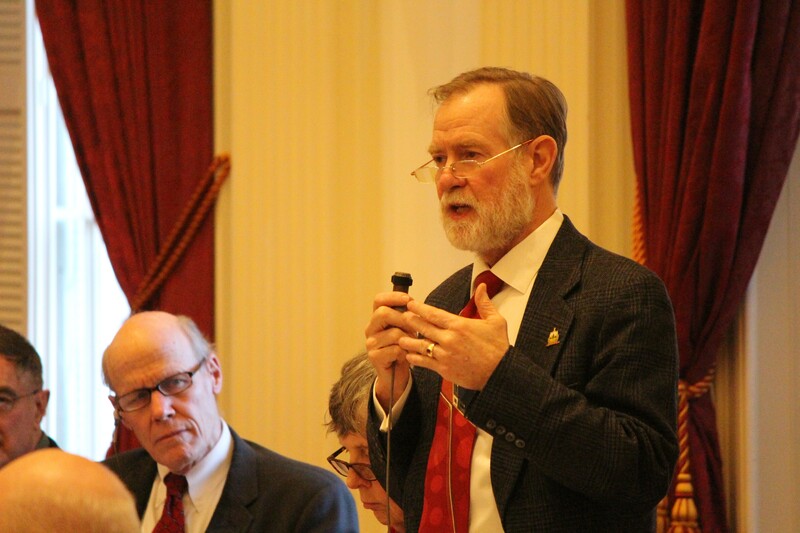 "It all boils down to getting in a room together," said Sen. Phil Baruth (D-Chittenden), the majority leader. Like Smith, Sharpe expressed confidence that the two bodies would reconcile their differences, though he, too, didn't know quite how. "It's sort of like a maze," he said. "You're not really sure which door you're going to come out of."